Challenging route. Syncros dropped off along the way. Amazing that Syncros made it up the rock ledges where we turned around. Placed a geocache. Write more stuff here! Tom turned back first, then Sue stopped, then Ed & Bonnie, then Brian Smith - I think? Just a short drive from the town of Shaver Lake. High views of Shaver Lake from Bald Mountain Lookout. The trail is fun to drive and is reminiscent of slickrock trails in Moab, UT. Rocky, steep and tippy in places. Best done in a modified vehicle. However, a good driver in an aggressive, high clearance stock SUV can get through with patience, a bit of rock stacking and an experienced spotter. For those willing to take some risk of minor damage, this is a very rewarding trail. Sometimes the snow doesn’t melt in the shaded forested sections until mid June. I found deep snow in late May and barely got through with the help of my winch. Route-finding is challenging because much of the trail crosses exposed granite where tire tracks are faint. The trail is marked with closely spaced Jeep symbols, but if you miss a turn, you can easily wander off in the wrong direction. Backtrack if necessary to last Jeep symbol. Best to drive the trail with someone who’s done it before. 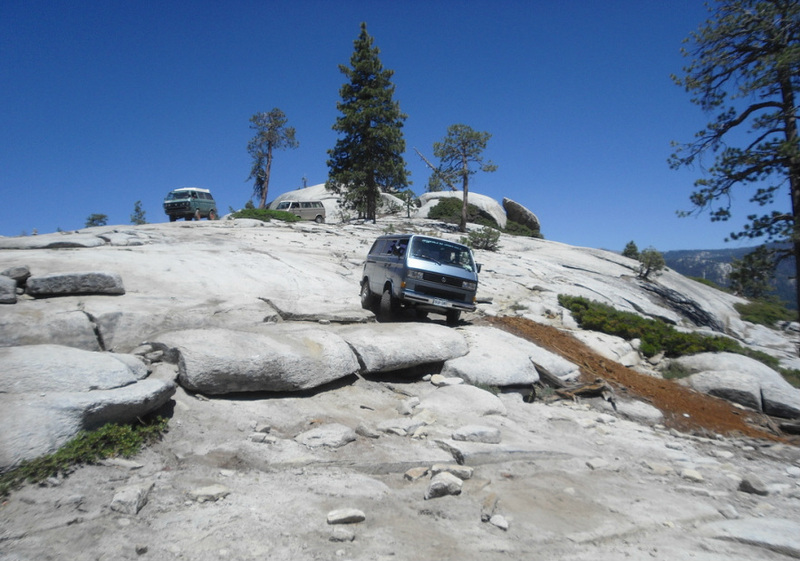 Excerpted from Massey & Wilson "Backcountry Adventures Northern California"
Bald Mountain OHV Route is a moderate trail that climbs to the fire lookout on Bald Mountain. It is a good trail for beginning off-road drivers to practice on before moving to harder trails. The route should be within the capabilities of most stock high-clearance 4WD vehicles. Navigation is difficult along the trail when it crosses over sections of bare granite; it is marked sporadically with jeep trail signs. Additional coordinates have been given in the route directions to aid navigation. The official forest service route describes a loop; however, the return portion of the loop is poorly marked. The route mapped out below is one way to the tower that has a fairly consistent level of difficulty and is marked by the official jeep route signs. You can either return the way you came or explore other marked routes in the vicinity. Variety of backcountry campsites and panoramic views from along the trail. From Massey & Wilson "Backcountry Adventures Northern California"
"Bald Mountain Fire Lookout (7,826') stands on bare rock and has a commanding 360-degree view." 2 High-clearance 4WD preferred, not necessary. These trails are dirt roads, but may have rocks, grades, water crossings, or ruts that make clearance a concern in a normal passenger vehicle. 3 High-clearance 4WDs are preferred, but any high-clearance vehicle is acceptable. Expect a rough road surface; mud and sand are possible but will be easily passable. You may encounter rocks up to 6 inches in diameter, a loose road surface, and shelf roads, though these will be wide enough for passing or will have adequate pull-offs. 4 High-clearance 4WDs are recommended, though most stock SUVs are acceptable. Expect a rough road surface with rocks larger than 6 inches, but there will be a reasonable driving line Patches of mud are possible but can be readily negotiated; sand may be deep and require lower tire pressures. There may be stream crossings up to 12 inches deep, substantial sections of single-lane shelf road, moderate grades, and sections of moderately loose road surface. 5 High-clearance 4WDs are required. These trails have either a rough, rutted surface, rocks up to 9 inches, mud and deep sand that may be impassable for inexperienced drivers, or stream crossings up to 18 inches deep. Certain sections may be steep enough to cause traction problems, and you may encounter very narrow shelf roads with steep drop-offs and tight clearance between rocks or trees. 6 These trails are for experienced four-wheel drivers only. They are potentially dangerous, with large rocks, ruts, or terraces that may need to be negotiated. They may also have stream crossings at least 18 inches deep, involve rapid currents, unstable stream bottoms, or difficult access; steep slopes, loose surfaces, and narrow clearances; or very narrow sections of shelf road with steep drop-offs and potentially challenging road surfaces.